My phone started going into shock Wednesday afternoon with the release of the 962-page proposed rule for the Medicare Merit-Based Incentive Program (MIPS) and Alternative Payment Model (APM) Incentive under the Physician Fee Schedule, and Criteria for Physician-Focused Payment Models. Vendors and providers alike have been eagerly awaiting the details hinted at by MACRA when it was passed last year. Providers were hopeful about the potential for consolidation of the alphabet soup of PQRS, VBM, and Meaningful Use. It starts with the customary glossary of acronyms, which numbers nearly three pages. It also includes an overview of current reporting programs and regulations. For people who haven’t been immersed in the federal regulatory stew for the better part of a decade, it must seem like so much gibberish. The provisions regarding the “Sunsetting of Current Payment Adjustment Programs” starts on page 35. A section on “information blocking” caught my eye on page 41 despite the fact that information blocking as defined by Congress seems much more theoretical than actual for most of the organizations I’ve encountered. Page 44 brings nearly three pages of new terms which require definitions. I gave it my best effort, but I couldn’t make it more than 100 pages. For those with longer attention spans, the comment period is open through June 27. Registration is open for the AMIA 2016 Symposium, to be held at the Chicago Hilton. The Student Design Challenge, now in its fourth year, will focus on engaging providers and patients in precision medicine. Proposals are due by June 30 with notifications to authors on August 15. 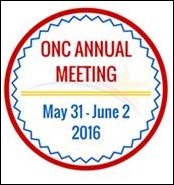 For those who can’t wait until the fall for your next informatics meeting fix, the 2016 ONC Annual Meeting will be held May 31 through June 2, with the last day being focused on consumers. Agenda details are still forthcoming, so I’m not quite ready to commit just yet. I enjoy attending conferences and connecting with colleagues across the country to discuss best practices and innovative ways to move healthcare forward. In my own world, though, I’d settle for healthcare that met the bare minimum. I’ve been in a downward spiral, with several negative ophthalmology experiences over the last several years, but this week’s visit took the cake. My physician (the third in that I’ve seen in the practice) recently went on an indefinite medical leave, so I was called to reschedule with one of her partners. I always book the first appointment of the day so that I can be on time for the rest of my schedule. Unfortunately, my new physician was stuck in traffic. He phoned the office five minutes after my appointment started. The practice has an open front desk, so I could hear the receptionist talking with him. I was dumbfounded when she told him that he didn’t have any patients in the office yet, especially since I had been checked in with my co-pay posted for 15 minutes. About five minutes after she finished the call with him, she called me up to tell me what was going on. After another 10 minutes, a technician took me back to an exam room to get things started so I’d be ready when he arrived. She asked my reason for visit, and when I told her, she promptly asked why I was seeing Dr. X because he doesn’t treat patients with my chief complaint. I reminded her that the practice is the one that scheduled me for the physician and should have known from my original appointment reason in the scheduling system what I was coming in for and that it was going to be a problem. I then got to hear through the open doorway as the staff called the physician in his car to ask what to do about me. He agreed to see me, which I thought was odd if it was outside his area of expertise, but I decided to keep the appointment so I could get my prescription, which had expired due to the rescheduling with my previous physician’s departure. When he arrived, he was apologetic, and told me “How great that was that the office was able to get in touch with you and have you come in later so you didn’t have to wait for me?” That’s certainly a creatively editorialized version of what happened, but by this point, I wasn’t surprised by anything. He performed only part of a typical exam, pronouncing my eyes “healthy” and then sending me to the front desk with a paper superbill that included charges for services he didn’t actually render. I hadn’t mentioned that I was a physician. I wonder if he would have performed the way he did had he known that I was? It shouldn’t matter, though – the things that happened during this visit shouldn’t have happened to any patient anywhere. The fact that this occurred at a major academic medical center was particularly distasteful. Although the office manager was appropriately horrified, I’m still waiting for a call back from the department chair. I have no idea whether his behavior was a result of his being late or generally poor practice. I’m waiting for a copy of my visit note to see what he documented in comparison to what he actually did and what he attempted to bill. In the meantime, I have an appointment across town to see another physician. If we can’t even get basic medicine right, what hope is there? Email me.